A new guideline recommends that patients diagnosed with HIV and tuberculosis (TB) receive prompt, coordinated treatment for both conditions. TB is a leading killer among HIV patients, and providing therapy for both illnesses simultaneously may help save lives. Tuberculosis (TB) is a major public health threat, with 9.6 million cases and 1.5 million associated deaths reported worldwide in 2014. With 13 years passing since the last guidelines on the treatment of TB and the development of a Grading of Recommendations Assessment, Development and Evaluation (GRADE) methodology to assess the quality of evidence behind recommendations made in guideline, the American Thoracic Society, Infectious Diseases Society of America, and CDC joined forces to develop a new guideline on the treatment of drug-susceptible TB. “Prompt and successful treatment of TB benefits patients as well as the communities in which they live because the infection is transmitted through cough aerosol,” explains Payam Nahid, MD, MPH, lead author of the new guideline. Since the last guideline was published, there has been a substantial increase in the publication of studies focusing on HIV and TB co-infection (HIV-TB), which has helped inform the optimal management of these patients, according to Dr. Nahid. “Perhaps the most significant change in the new guideline relates to the management of patients with HIV,” he says. Specifically, the guideline writing committee addressed whether antiretroviral therapy (ART) initiation should occur during TB treatment or after treatment is completed. The update also addresses the duration of treatment for HIV-TB. One of the recommendations that Dr. Nahid feels benefited greatly from the GRADE methodology is focused on case management strategies. Case management—which includes patient education and counseling, field and home visits, providing patient reminders and incentives to complete therapies, and use of directly observed therapy (DOT)—has been shown to improve treatment success. The new guideline note that appropriate case management is essential to ensuring effective treatment of all TB patients. In DOT, clinicians watch patients swallow each dose of medication during the 6-month course of therapy. “The evidence synthesized in the new guidelines on case management strategies offers a better appreciation for the very real value of patient education and counseling, DOT and other interventions to improve treatment success, and to reduce the risk of poor adherence and potentially unfavorable outcomes from treatment,” says Dr. Nahid. Payim Nahid, MD, MPH, has indicated to Physician’s Weekly that he has no financial interests to disclose. Nahid P, Dorman S, Alipanah N, et al. Official American Thoracic Society/Centers for Disease Control and Prevention/Infectious Diseases Society of America clinical practice guidelines: treatment of drug-susceptible tuberculosis. Clin Infect Dis. 2016; 63:e147-e195. Available at http://www.cid.oxfordjournals.org/cgi/pmidlookup?view=long&pmid=27516382. CDC. TB guidelines: treatment. Available at http://www.cdc.gov/tb/publications/guidelines/treatment.htm. 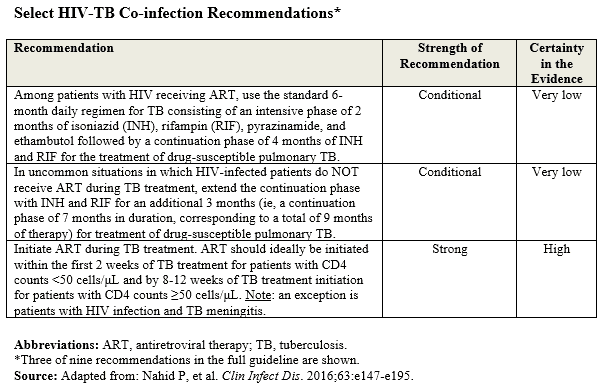 Ahmad Khan F, Minion J, Al-Motairi A, Benedetti A, Harries AD, Menzies D. An updated systematic review and meta-analysis on the treatment of active tuberculosis in patients with HIV infection. Clin Infect Dis. 2012;55:1154-1163. Masur H, Brooks J, Benson C, Holmes K, Pau A, Kaplan J. Prevention and treatment of opportunistic infections in HIV-infected adults and adolescents: updated Guidelines from the Centers for Disease Control and Prevention, National Institutes of Health, and HIV Medicine Association of the Infectious Diseases Society of America. Clin Infect Dis. 2014;58:1308-1311. Luetkemeyer A, Kendall M, Nyirenda M, Wu X, Ive P, Benson C, et al. Tuberculosis immune reconstitution inflammatory syndrome in A5221 STRIDE: timing, severity, and implications for HIV-TB programs. J Acquir Immune Defic Syndr. 2014;65:423-428.